In a short span of time, the United States has been hit by two devastating hurricanes. Hurricane Harvey only recently passed through Texas and Louisiana, wreaking havoc on many communities and countless Americans. Soon after, Hurricane Irma unleashed its wrath on a majority of Florida. But through the danger, destruction, and panic, hope is shining through. Americans of all backgrounds and beliefs are banding together to help one another out. Be they rescue workers or volunteers, or just generous neighbors, these people are showing the true colors of the American spirit. That’s just what we saw in Robert and Lori Clark. As forecasts predicted that Hurricane Irma would be a historically powerful storm, residents across Florida started evacuating. They left their homes in the Florida Peninsula, in search of safe havens in states like Georgia, Alabama and beyond. The Clarks watched as countless people came rolling through their town of Fairhope, Alabama. As shelters, homes, and hotels started to fill up, they knew that soon, so would the restaurants. Local eateries would be packed with people, forced to send many away hungry. So this couple decided to pitch in and help fill some empty bellies. The Clarks hit up their local grocery store and loaded up with supplies. They swung by the Alabama Welcome Center, putting up a tent for all to see. Then they got to work, grilling up some hot dogs. As evacuees came in from Florida, they were greeted with warm smiles, and free food. These weary travelers, worried and harassed by the coming storm, at least had one thing to cheer them up. The goodwill spread, as more volunteers handed out water bottles and snacks free of charge. During the day, they fed hundreds of thankful Floridians, proving that when times are tough, Americans are ready to help each other. As thousands of Floridians flock to Alabama to avoid Hurricane Irma, one Alabama couple is ensuring that evacuees are well-fed on their journey to higher ground. 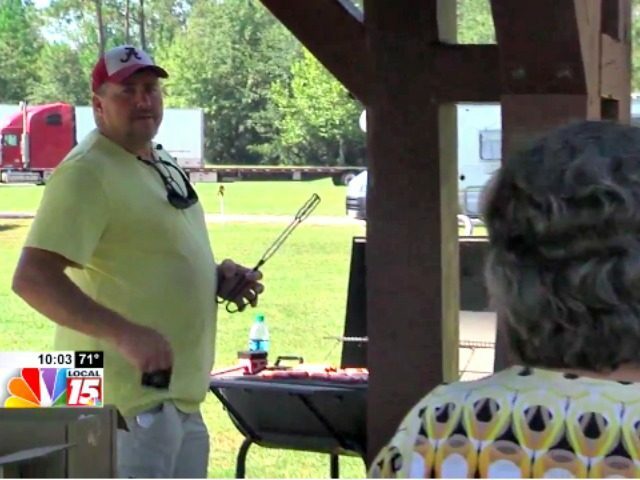 WTHR reports that several residents of Fairhope, Alabama, pitched a tent at the Alabama Welcome Center on Interstate 10 and cooked hot dogs for those on the road. “It ain’t in their budget for what they’re having to do right now. These restaurants are gonna be packed. Just seemed like the thing to do,” Robert Clark, who started the idea with his wife, told WPMI. Clark and his wife, Lori, say they have fed hundreds of weary travelers, including one family who spent 15 hours in the car traveling from their home in Port Charlotte, Florida, on the Gulf Coast. Volunteers are also handing out water bottles and snacks as well as the hot dogs at no cost to those hitting the road. “It makes you feel good but we’re all supposed to help each other. Unfortunately, sometimes it’s only during a storm. But we just want people to know we’re thinking about them and care about them,” Lori Clark said. The Clark family said they would continue to serve hot, free food to those in need, as long as they could afford buying hot dogs. And as long as the supplies hold up, I’m sure! This is just one of the many remarkable stories we’ve been seeing in recent weeks. After a long year of divisive poison from politicians and our media, we need to know how real Americans are behaving. We are not the angry mobs of protesters, ready to throw rocks and punches at someone on the other side. We are neighbors, friends, and family. We are united by common values, beliefs, and traditions. Despite disagreements, politics, and arguments, we are one nation. And when the chips are down, we act that way. Throughout the coming weeks and months, as Southern states rebuild from these storms, we will only continue to see Americans working together. Through the danger, destruction, and pain, people come out of the woodwork to help their fellow man. Without a second thought, we are seeing Americans jump into action to save lives, rebuild from the ruins, or even hand out a simple hot dog. That’s the kind of people we’ve always been. And that’s the kind of people, God willing, we will always be. NBC Reports Trump Was RIGHT – Confirms ISIS Found In HORRIFIC Place! Nurse Saw Refugee RUN Out Of A Room, HORRIFIED By What Was Found! FBI: HOARDS Admitted To US As REFUGEES Are ISIS — Trump Infuriated!